20½ in. (52.1 cm.) diam. 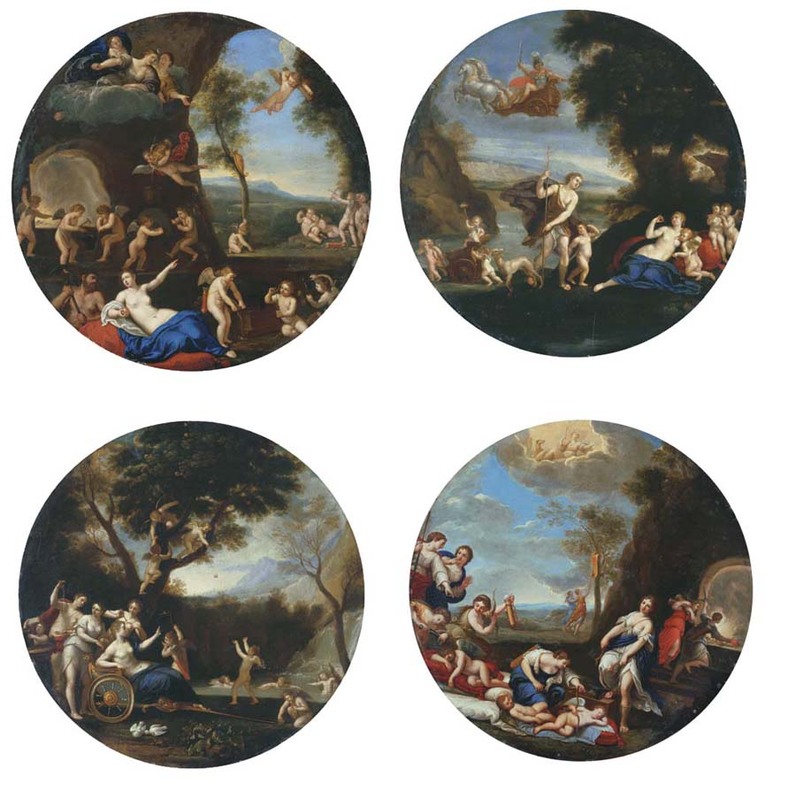 These four roundels are early copies after Albani's famous cycle in the Villa Borghese dating from circa 1617-21 (C.R. Puglisi, Francesco Albani, New Haven and London, 1999, pp. 135-6, no. 48). The originals were commissioned by Cardinal Scipione Borghese, and seem to have been completed when Albani was back in his native Bologna, before he moved to the court of Ferdinando Gonzaga in Mantua from August 1621. At least three of the paintings had been finished by 1621, according to a receipt in the archives of the Villa Borghese (ibid., p. 135). Around 1658, the four canvases, along with other important pictures, were moved from the Villa to the Palazzo Borghese on the instruction of Prince Giovanni Battista Borghese. Copies were made of the four roundels to hang in the Villa, in the places vacated by the originals. Under Napoleon, the originals were taken to France, and were only returned in 1816, becoming part of the Museum's collection in the Galleria Borghese. The copies, however, were lost and have so far not been traced. The present copper roundels are reduced versions of the original series and roughly a third of the size of the canvases painted by Albani. The subjects are taken from Ovid and represent Albani's first treatment of such mythological landscapes. The great success of the cycle inspired the artist to develop further variations on mythological subjects, seen as the visual equivalent of the Classically inspired idylls by the poet Giambattista Marino (1569-1625), and these idyllic landscapes formed an important part of his mature work.